How to run a check? A feature of all modern models of the Volkswagen concern is the lack of a self-diagnostic function on the instrument cluster and the display of error codes on the panel. 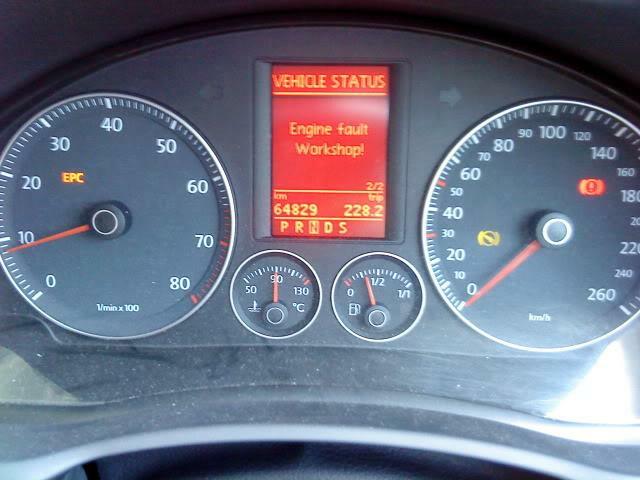 To read the existing faults on the Volkswagen cars release after 1995, the diagnostic cord and the program installed on the computer or laptop are used. On many machines, for example, Golf 4 or Passat B5, a self-test of the systems was applied with information displayed in German or English on the instrument cluster screen. For the first time such a function was installed on the 4th generation Golf cars in 1997. No manipulation is required to read the error codes. When the engine starts, it polls all the systems and control units of the vehicle. If a malfunction is detected, information about it is displayed in text format on the screen and is complemented by a flashing or lit indicator. In this case, the signal may be yellow or red (high level of importance) color. Messages of high importance are complemented by a triple beep, the rest - once. For example, if the oil level drops, an inscription will appear and the oiler icon will flash. If you are unable to remove the error yourself (topping up the oil, coolant or windshield fluid or filling the tank), you should carry out computer diagnostics of the car, which will allow you to accurately determine the cause of the fault. On earlier machines (before 1995 release), errors can be read by a tester and a light bulb, which flashes the fault code in flashes. 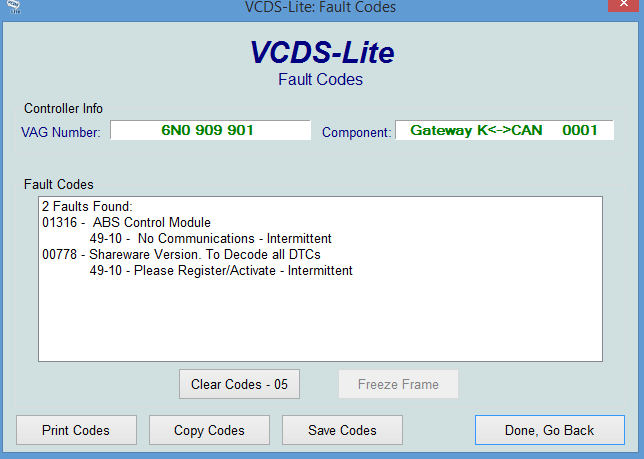 VCDS software, which is an original product and works only with a HEX-USB + CAN cable. VDS-PRO, operating under the MS-DOS operating system and reading data only on the COM port with VAG COM 409.1 cord. VAG EEPROM Programmer, which has a small set of functions and works with any type of VAG COM 409.1. VAG K + CAN Commander, a more advanced version of the previous program. In addition, there are lots of highly specialized programs for reading and adjusting data in separate electronic blocks of machines. For example, in the instrument cluster or transmission control unit. Carrying out diagnostics on the old Passat B3 is shown in the video from the author AUTO repair / NA / knee. On Volkswagen cars of various years of release, various fuel injection systems were installed, so the type and location of the diagnostic connector can vary. The 80s Golf and Jetta cars with Bosch Mono-Jetronic fuel injection system have a single-pin diagnostic connector installed next to the ignition coil. The pin is red-white or yellow. On a similar machine system Passat, this wire has a yellow-black insulation. Since April 1989, the Passat B3 has been equipped with a two-pin connector located under the cover below the climate control unit. On later machines, the connector began to be placed at the feet of the driver or passenger sitting in front. Stop the unit, leave the ignition on. Connect the tester wires to the connector. The LED will start flashing four-digit error codes. In this case, the numbers from 1 to 9 are transmitted by short flashes, and 0 - by a long two-second flash. There are short pauses between the digits of the code. The end of the transmission of codes is signaled by the signal 0000. Turn off the ignition and disconnect the tester from the connector. Decrypt the received codes by tables. In addition to the diagnostic methods described above, on Volkswagen cars of 1990-2000 release, it is possible to conduct a separate inspection of the microclimate system on the display of a single-zone air-conditioning unit. On more modern versions of the control panel there is no such function. Turn off the system fan and turn off the ignition. Simultaneously press the recirculation and economy keys and hold them for 3 seconds. Turn on the ignition, without releasing the buttons. The self-test mode will turn on during which all fan speed steps will be completed. An error code (if available) will appear on the screen and the number 00 on the right. Errors are scrolled with the air temperature increase button. The appearance of the code 000 indicates the end of the list. Pressing the economy mode button for 3 seconds erases errors from the memory of the control unit. At the same time, the inscription 444 appears. To exit the self-test system, press the economy mode button. Below are the most common warnings that appear on the dashboard during a vehicle self-test. HANDBREMSE ANGEZOGEN! The handbrake lever is not released. MOTORSTORG WERKSTATT! Faults in the engine management system. May be duplicated by a burning EPC icon. On vehicles with electric power steering such as Sharan, error 00778 may occur, indicating a failure or incorrect values of the values from the steering wheel position sensor. In this case, the instrument cluster may light up a fault indicator in the power steering. A solution to the problem can be an adaptation of the sensor and checking the camber / convergence of the front wheels. The failure of at least one sensor on the wheels causes a common error in the ABS / CAP system with code 01316. Such a problem can occur on any machine with an anti-lock system, including the Touareg. On the most recent models, for example, on the 7th generation Golf, an error B10001B occurs due to the oxidation of wires in the plug of the airbag sensor and the increase in resistance in this contact. The problem is fixed by cleaning the contacts and covering them with a protective compound. Breakdown of the EPC system, which provides electronic control of the throttle position. The appearance of this error is indicated by the yellow EPC indicator yellow on the instrument cluster and the engine speed limit. The cause of the malfunction is a breakdown in the actuator mounted on the throttle assembly. There are two ways to solve the problem - replacing an expensive assembly with a new one or collecting and repairing an old part. Very often, the problem lies in the oxidation and cracking of the tracks, which are fed by signals from the pedal and the control unit of the ENP system. After repairs related to disassembling the timing drive, an error P0016 or simply 0016 may occur, which means the relative position of the engine shafts is incorrect. The owner should check the marks on the drive gears and align them. On TSI engines installed on the Polo or Transporter, error 0010 may appear, caused by the destruction of the valve body terminal of the camshaft adjuster. The problem is fixed only by replacing the valve itself. Sharan and Caddy (and other VAG car brands) encounter error 01314, which speaks of a periodic signal loss from the engine control unit. A more detailed diagnosis can solve this problem, since the fault can be in the unit itself, in the relay or in the wiring. Errors with the code 00772 denote the failure of the oil pressure sensor or its wiring and can occur on any gasoline engines and diesel engines installed, for example, on Tiguane or Turan. Diesel Touareg with large runs often have an error P2002, indicating the wear of the diesel particulate filter of one of the cylinder blocks. 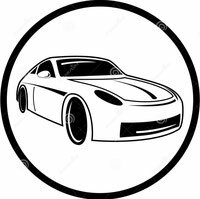 It is possible to repair a part by carrying out regeneration in accordance with the recommendations of a car-care center. Another problem for elderly diesel engines is clogging of the valve of the USR system, which is reflected in the glowing lamp and the engine switching to emergency mode. These are symptoms of error P0403, which can be corrected by cleaning and washing the valve assembly. A frequent malfunction on Polo Sedan or Tiguan cars is error 00532. It usually occurs when a large electrical load is turned on while driving in urban traffic. It is expressed by a warning beep and the ABS lamp is turned on in the instrument cluster. After restarting the engine and reducing the load on the network, the problem does not arise again. This error indicates a voltage drop in the on-board network due to the discharge of the battery or damage to the wiring area. To remedy the situation, you must charge the battery and check the electrical circuit for a short circuit. The battery will have to be replaced with a strong deterioration and repeated errors due to this. On the Golf and Caddy models with mileage, an error 00588 often occurs, which is displayed on the instrument cluster in the form of a burning lamp of an air bag system. The reason may be poor contact in the connectors connect the pillow and wiring. Occasionally the contact is broken in the control unit itself due to ingress of dirt and moisture. For all the machines of the VAG concern, the error U111300 is characteristic, indicating the limitation of the functionality of a node due to the errors in its work. You should carefully check the wiring of such a car, because the problem lies in it. The most common errors are listed. 511 Similarly in a foot air duct. Error 00463. Appears on cars Touareg or Cuddy with modern audio systems. Indicates breaks in the data stream from the control unit of the standard digital audio system. In this case, the audio system itself works intermittently. You can fix the problem only by carefully checking the status of the wiring and the unit itself. A common mistake is 00476, indicating a problem with the diesel pump control unit. Such a malfunction is associated with intervention in control units that store mileage data. The effective method of correcting the error is to clear the CAN bus control unit from the trouble codes and the new system coding. In this case, CAN-bus will analyze the installed blocks and remove the missing ones. Usually, after this error disappears. Owners of machines with a DSG robotic box are well aware of the P189C error, indicating a loss of pressure in the box’s hydraulic block or cracks in the mechatronic housing. Another common problem is the error P17BF - constant on-off hydraulic pump in the box. The cause of the error should be sought when disassembling the box in a specialized service. Very often, such a problem is a signal for the rapid replacement of mechatronics. On Tiguan or Crafter machines equipped with engines with a turbocharger, an error P10A900 (or P10A0) may appear, indicating that the electric drive of the regulator of the amount of air supplied to the boost line is broken. At the same time, the Check Engine lamp is on, fuel consumption increases slightly, and the maximum speed of the power unit is limited to 3000. The situation can only be corrected by replacing the part. In this case, the error is removed from the memory independently, after a run of 10-15 km. Need to read fault codes. Turn off the ignition without disconnecting the tester wires. Press the contact tester button. Turn on the ignition and after 5 seconds open the circuit breaker contacts. Disable the ignition system. Errors reset.